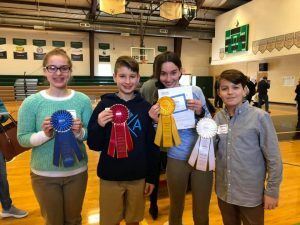 Summit Christian Academy (SCA) was well represented at the Association of Christian Schools International (ACSI) District Spelling Bee held recently at Maranatha Christian Academy in Shawnee, KS. SCA had 17 students representing grades 2-8 and 12 of these placed in the top five in their grade level. SCA had four spellers that advanced to the Regional Spelling Bee to be held in Plano, TX in March. Those four spellers include: Olivia Truesdale, Michael Ward, Lucie Epema, and Adrian Haack. Four SCA students qualified to compete in the Regional ACSI Spelling Bee in Plano, TX in March. Those students include (left to right): 8th grade student Olivia Truesdale, 6th grade student Michael Ward, 6th grade student Lucie Epema, and 7th grade student Adrian Haack.